UPDATE: I have added more ORIGINAL ART for sale, please scroll down to the bottom of the post to see other one-of-a-kind artwork listed. 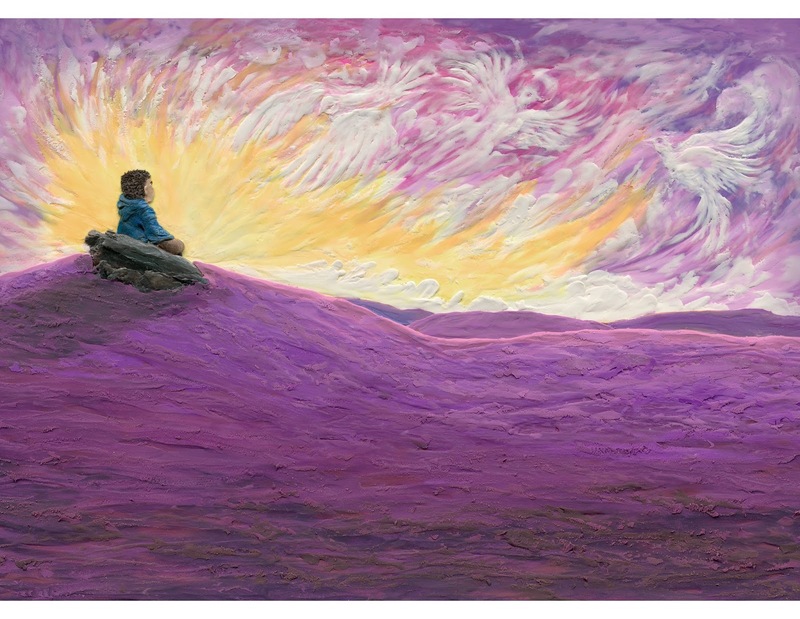 There are also a few original art pieces listed yesterday that are still available and of course, the art prints! Today, June 20 is World Refugee Day 2017! For 4 days only, I am holding an ART SALE of limited edition FINE ART PRINTS and ORIGINAL ARTWORK from my recent book, My Beautiful Birds. 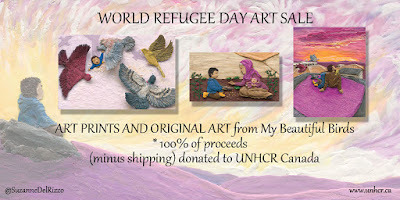 I will be donating 100% of the proceeds (minus shipping) to UNHCR Canada. Payment may be made via Paypal or cheque. *if you would like other prints not seen here please inquire. 'Sami at Camp' (`10x12) for $250. Original, one-of-a-kind artwork made form polymer clay and acrylics. 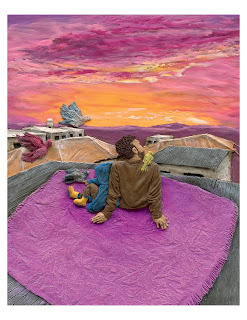 'My Beautiful Birds cover option B (~10x12) for $250. Original, one-of-a-kind artwork of alternate cover design not used for the book, made form polymer clay and acrylics. 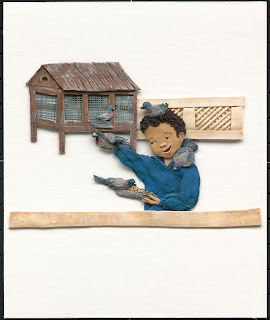 NEW ADDITION : 'Sami feeding the pigeons' (~8x10) for $150. 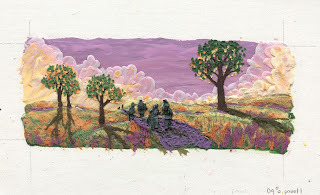 Original, one-of-a-kind artwork of alternate cover design not used for the book, made form polymer clay and acrylics. 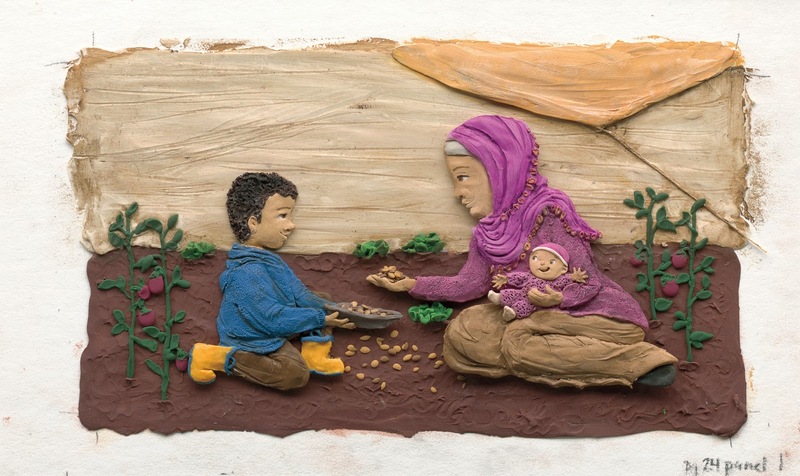 NEW ADDITION: 'Father plants a Garden' (4x4) $60. 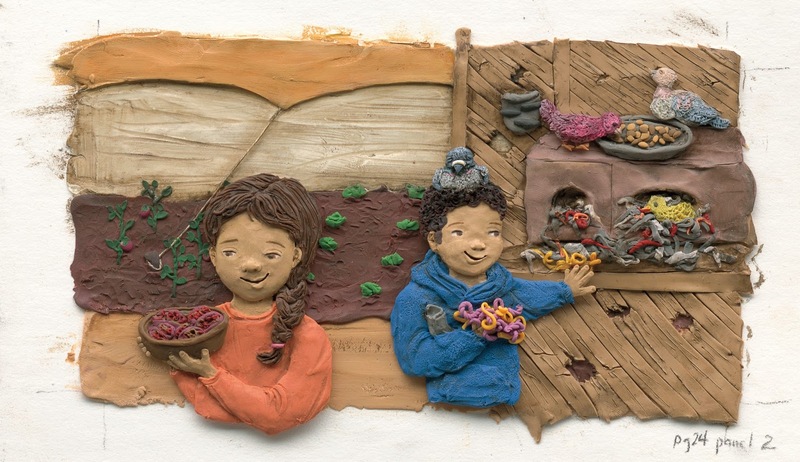 Original, one-of-a-kind artwork of alternate cover design not used for the book, made form polymer clay and acrylics. NEW ADDITION: 'Neighbors open shops'(4x4) $60. 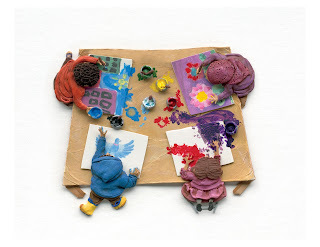 Original, one-of-a-kind artwork of alternate cover design not used for the book, made form polymer clay and acrylics. NEW ADDITION: 'Mother cooks'(4x8) $80. Original, one-of-a-kind artwork of alternate cover design not used for the book, made form polymer clay and acrylics. NEW ADDITION: 'Sami and the Pigeons' $200. Original, one-of-a-kind artwork of alternate cover design not used for the book, made form polymer clay and acrylics. To download, please click on the screen resolution above and then right click and "save to desktop". I managed to borrow it back to read it again( a few times) and write my review. 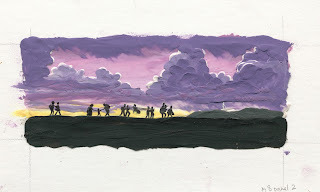 First off, let me just say I am a bit of a picture book design nerd, so before I even get to the actual story, I have to talk about the design. I really love the large trim size, the height of the portrait orientation nicely compliments the action inside. And seriously, how eye-catching is this cover? We all remember catching raindrops on our tongue- looove it. The satin-y matte dust-jacket helps to accent the fun, retro vibe of the stylized illustrations and limited colour palette of both the cover illustration and interior artwork. I know I have probably said this a ton lately but... I am so loving the trend of decorative/illustrated end papers. I love how it enables the illustrator to stretch out the story and add their visual contribution... even before the story starts! Anyway, back to this book! 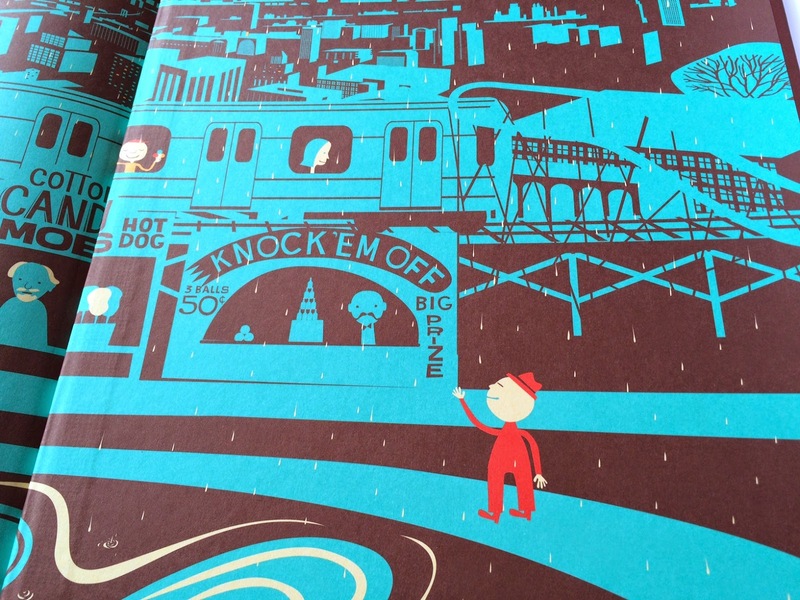 The decorative end-papers set the stage; the front end-paper depicts bustling Coney Island’s beachfront board-walk in daylight then, to wrap up the story just so, the back end-paper ends depict the same setting but in two-tone night-time, moon/street-light perfection with the last few patrons(whom have braved the rain) are illustrated in little hits of colour. Even the hand-lettered font of the title(see top image of the cover) is exciting and visually appealing. 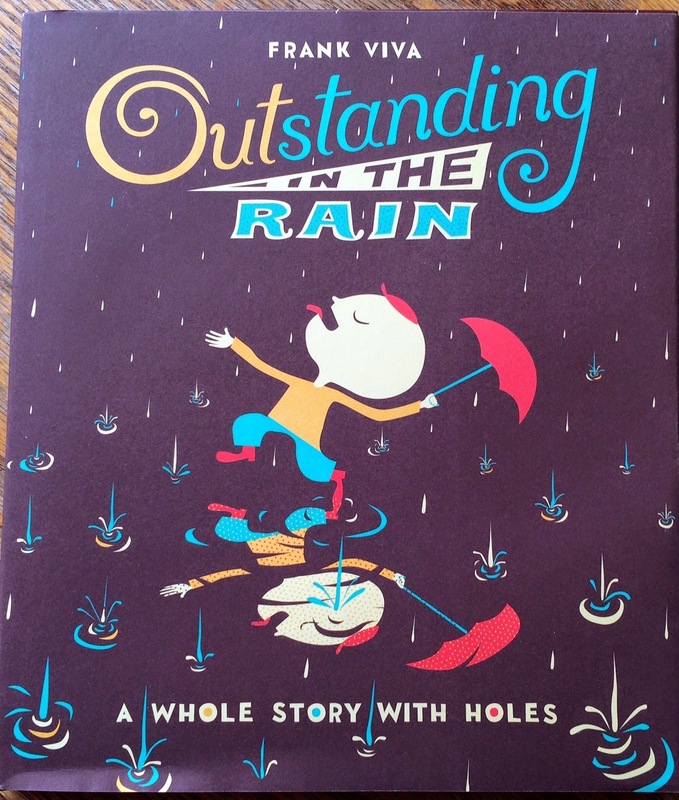 It sets the tone of the book wonderfully, introducing the fun word play of oronyms and mischievously hinting at the soon -to-be discovered die-cuts, with the tag line at the bottom of the cover -“A whole story with holes”. The story begins with a young child and his mother arriving at Coney Island by train. Here they spend their special day together going on rides, eating treats and exploring. Along the way, things don’t go quite as planned and they encounter a few unexpected surprises. 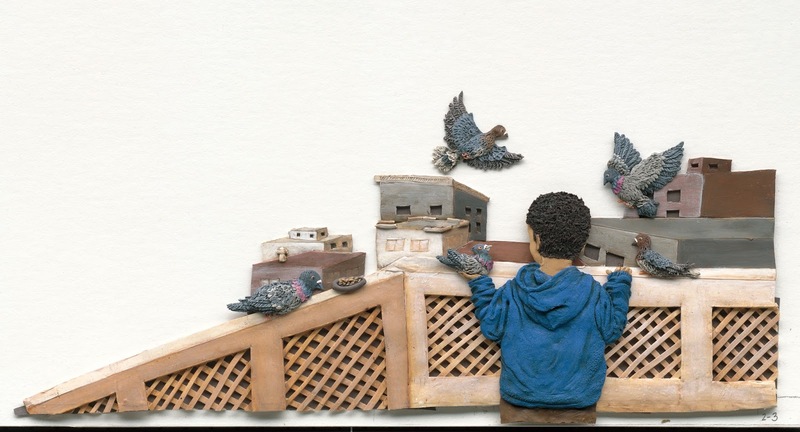 Viva does a wonderful job of depicting the enjoyable ups and unexpected downs of childhood. Oronyms- phrases that sound the same but have different meaning, are used creatively throughout the book. Each page is skillfully designed to place these oronyms within a die-cut shape on the right-hand page which, upon turning the page, is now on the left-hand page, becoming an integrated surprise element within the illustration. The cut-outs vary in size and shape, to compliment the text and their placement works to advance the story with successful visual appeal. Maybe this would be easier to describe with a visual? 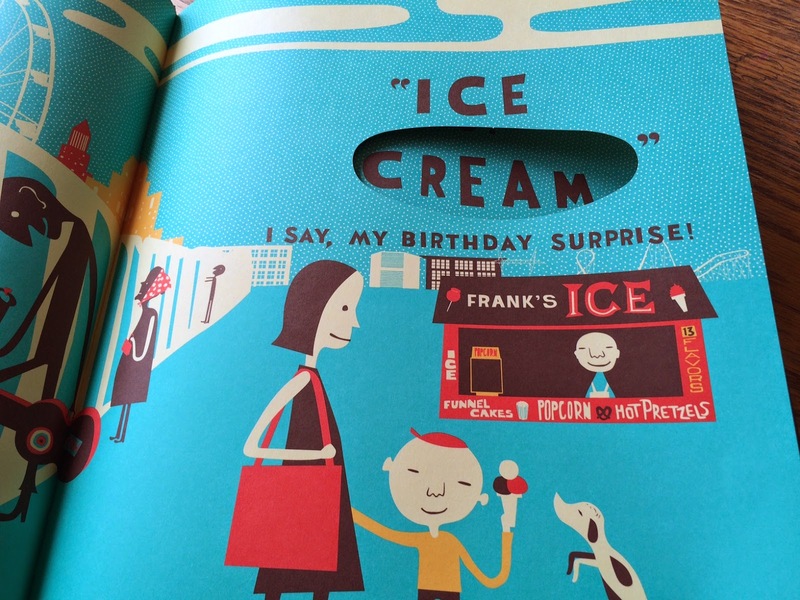 “ ‘Ice cream’, I say, my birthday surprise, he exclaims.” The word “cream” is placed within an oval shaped die-cut under “ice” which after the page turn becomes “ scream” when the boy sadly drops his treat. “ ’Oh no!’ I scream, with tears in my eyes”. 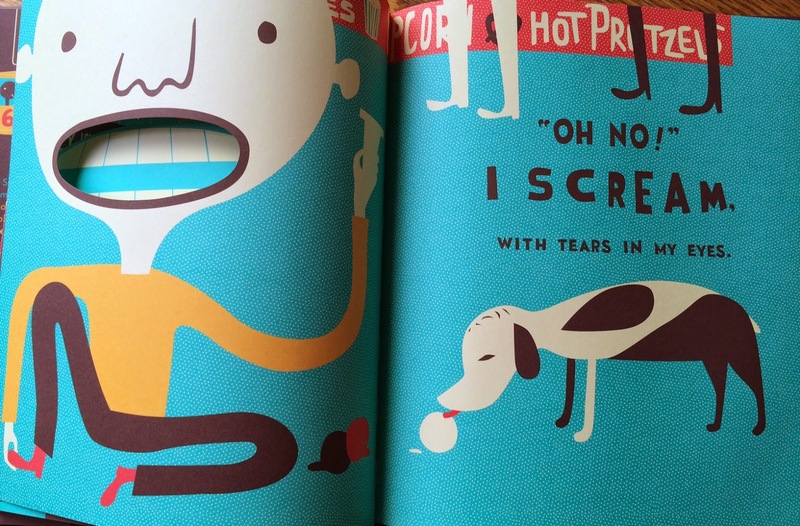 The left-hand page now contains the oval die-cut, the shape of the boy’s mouth (showing his teeth). The teeth peek through from the previous page which was the front detailing of the D train entering Coney Island station. At times, due the restriction of using oronyms on each page, the rhyming text feels slightly forced, but all-around I think Viva succeeds in creating a delightful story unified by superb design. With features such as the fun die-cut elements, and retro-flavoured, colour-blocked illustrations all combined with playful oronyms, within kid-centric text, this book is sure to elicit giggles and high-fives from kids and adults alike. Sending out a big "Thank-you, Tundra" for having these fun Tundra Reading Club contests on your blog. It is such a great way to promote your new titles, and interact with book-loving folks. And...who doesn't love the chance to win free books for that TBR pile? With the last bits of snow gradually melting away on the odd warm-ish day of these crazy Canadian (fluctuating) temps, our backyard rink has been appropriately renamed "the pool". In the garden the first daffodil sprouts have started popping up. Spring is here- yay! I thought a Spring-y desktop calendar was just right for this month. This spot illo comes from a spread in Skink on the Brink where Stewie travels through the changing seasons from his home pond to a far away pond. Along the way he also changes in colour from a juvenile black skink (with an amazing blue tail) to a grey adult skink. To download this desktop calendar, please click on the screen resolutions above then right-click on " save to desktop" to download. 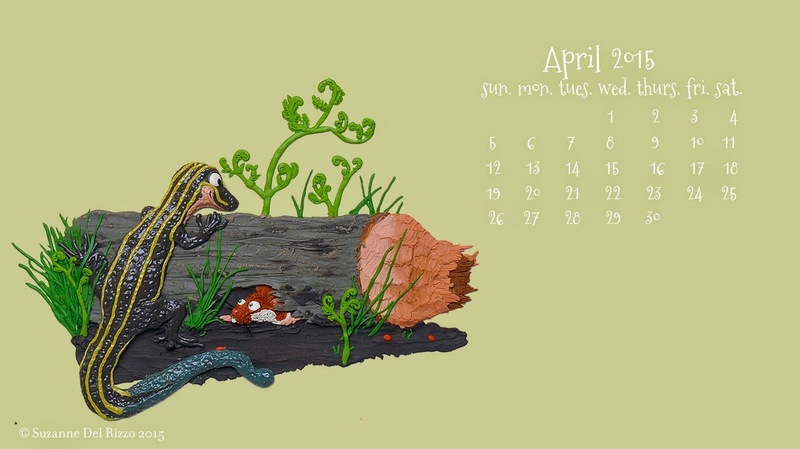 March 2015 Desktop Calendar featuring interior artwork from my latest picture book Gerbil, Uncurled! 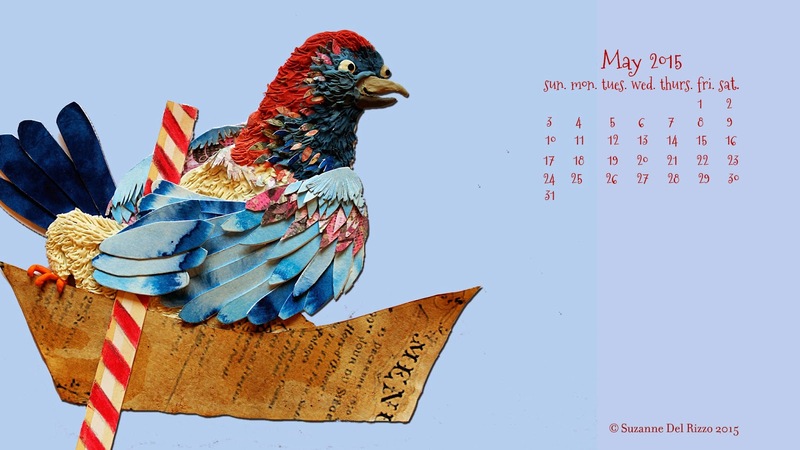 With February drawing to a quick close, I have posted my new March 2015 desktop calendar a few days early. 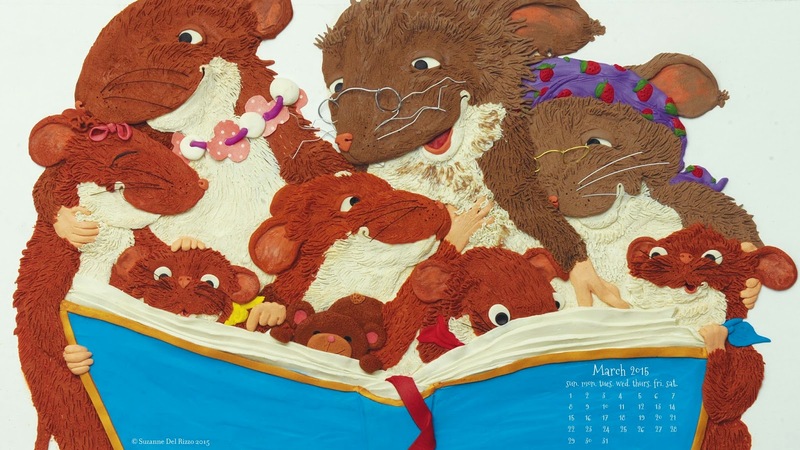 This calendar features the entire extended gerbil family featured in my latest picture book, as illustrator, Gerbil, Uncurled( by Alison Hughes, Fitzhenry & Whiteside June 2015). Let me introduce you to the horde. We have Grandpa, Grandma, Mama, Sister, Little Gerbil and her mischievous triplet cousins...and Teddy too, of course! Alison and I have been pouring over the colour proofs this week, we are SUPER excited to see it all come together. 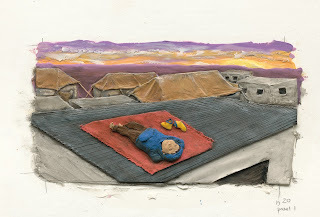 Our editor, Cheryl Chen, has graciously given me the "thumbs-up" to share one of the interior illustrations for the book. I couldn't resist using it to create my March calendar. Please click on the screen resolutions above then right-click on " save to desktop" to download. 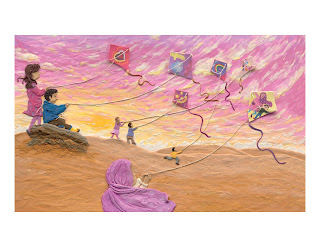 This picture book will be part of the Tell Me More Storybook series. It contains 2 pages of bonus non-fiction back matter. 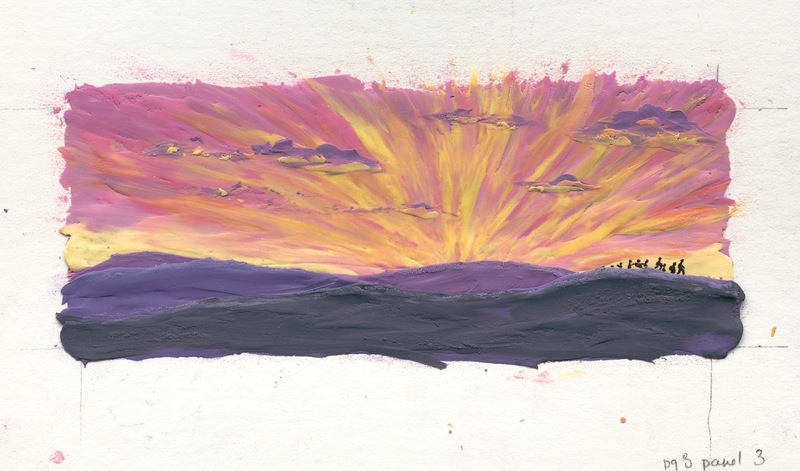 It also has fully illustrated end-papers! *squeals* SO FUN! Here is the back cover copy: "Little Gerbil has learned all of the important Gerbil Mottos from Grandpa: Always Keep Your Whiskers Clean, Celery Tops Come to Those Who Wait, etc. But there is one motto that Little Gerbil just can't manage to keep: Curl Up Nose to Toes when it comes time to go to sleep. At the weekly Gerbil Circle meeting she knows she has to tell the truth. Little Gerbil discovers that she is not the only one that has problems following some of the Gerbil Mottos." 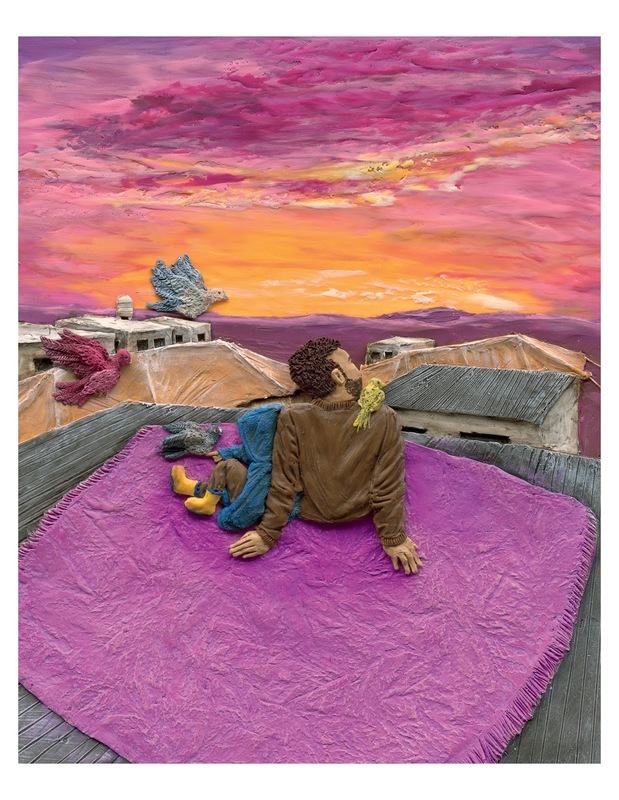 Andrew Larsen's Charlie's Dirt Day, illustrated by Jacqueline Hudon-Verrelli is the latest book in the Tell Me More series to hit the shelves. Have you seen it yet? It's delightful! I hope you enjoy the calendar, Alison and I can't wait to share this book with you. Be on the look-out, it is due to hit the shelves in June! January 2015 Desktop Calendar and Update! 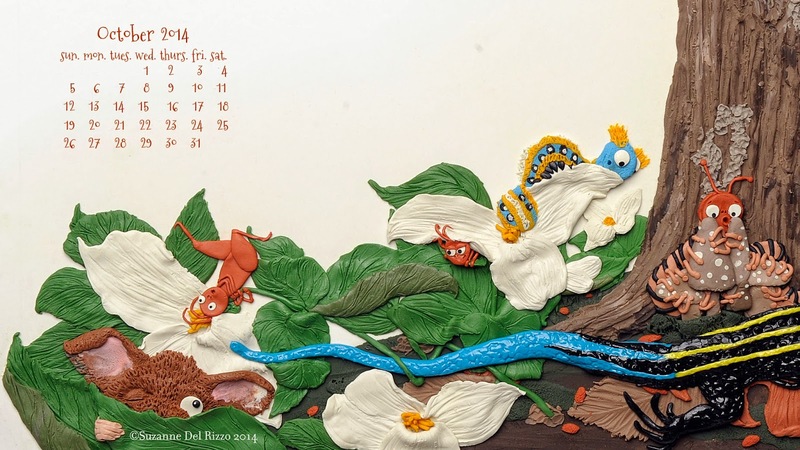 Here is my January 2015 desktop calendar! Let me introduce you to Little Gerbil. 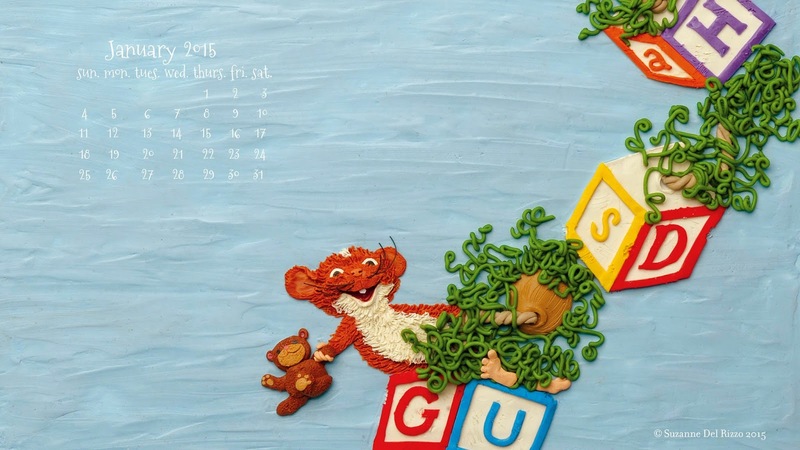 Her book, Gerbil, Uncurled, written by Alison Hughes (published by Fitzhenry & Whiteside) will be hitting the shelves later this Spring. We are so excited! 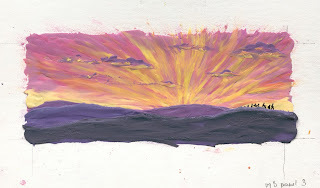 and I can't wait to share some sneak peeks of interior art with you. To download this calendar simply select the resolution from the list above, right click, and "save to desktop". Wow, the last few months have been a whirlwind of activity. 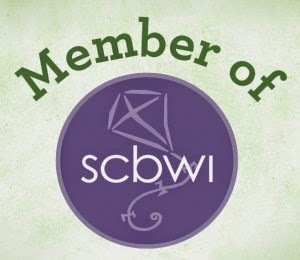 In October I headed to Ottawa for the SCBWI CanEast conference. 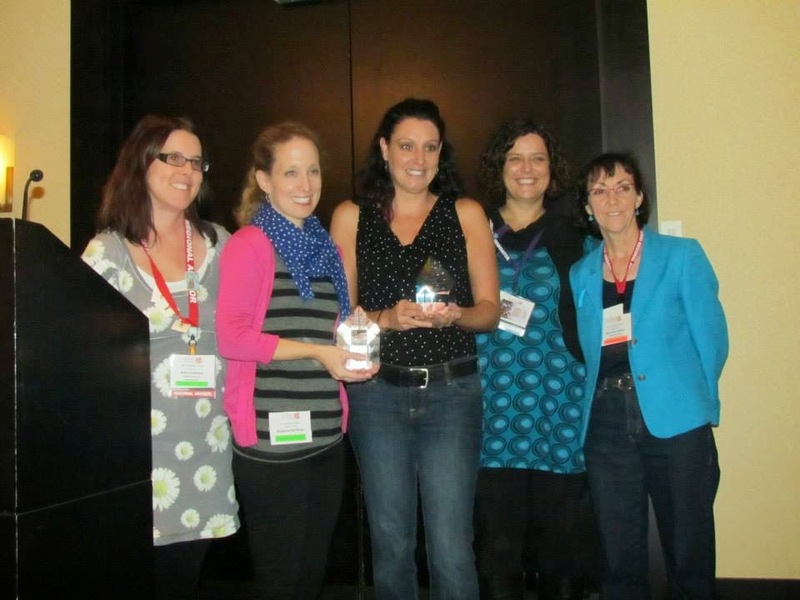 Lisa Dalrymple and myself were presented with the 2014 SCBWI(Canada) Crystal Kite Award for our book Skink on the Brink. We are still over the moon about having Skink on the Brink, along with I Dare you not to Yawn, by Helene Boudreau, chosen by our SCBWI peers. In November I jetted off to the tropics to take part in the second annual Rainforest of Reading Award Literacy Festival. 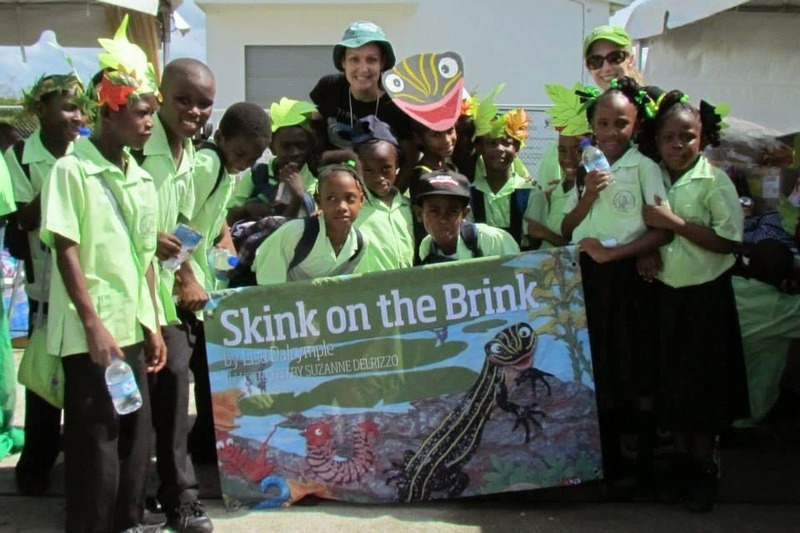 We traveled to Grenada and St. Lucia along with 8 other wonderful authors and illustrators, the OneWorld Schoolhouse Foundation, volunteers from the SJK IB programme and the MacLeod family. We saw approx. 6000 children over the course of 3 festival days. I can honestly say that this trip was a life-changing experience. The amazing memories and new friendships I made will be forever cherished. Joyce Grant blogged about the trip, summing up our experiences so perfectly and eloquently. (Some smiley-girl who loved the co-pilot seat in the 7-seater plane "hop"
With 2015 comes fresh ideas, new possibilities and awesome opportunities. Wishing everyone a wonderful, happy, and healthy HAPPY NEW YEAR! Good bye summer, hellllooooo fall! Wow, September flew by, didn't it? Yes, fall is in the air, the first colds of the season are making the rounds through our house, and the leaves are starting to change colour. There has been a flurry of activity here with the start of another hockey season for the kids, cadets for my eldest, and early morning cross-country practices. 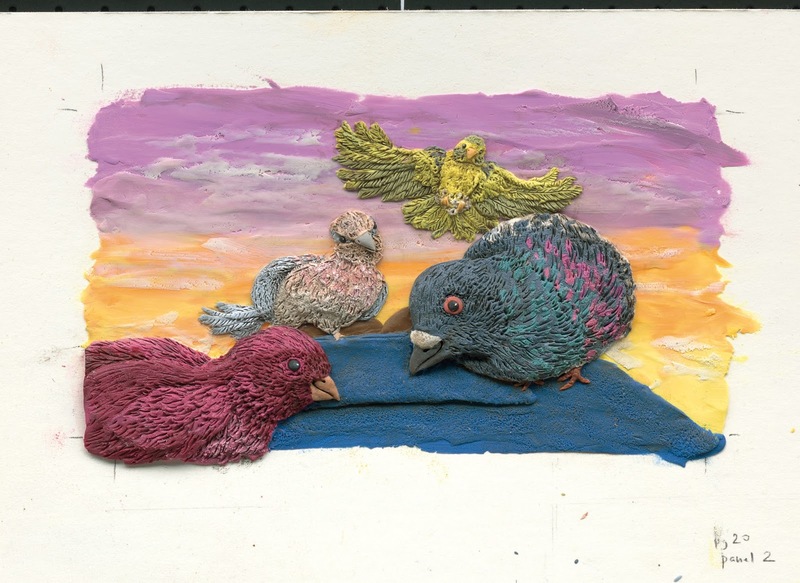 As for me, I am working away on the final art for another picture book as well as gearing up for the SCBWI CANEAST conference in Ottawa on Oct. 17-19. It also won't be long until I head off to St Lucia and Greneda for the Rainforest of Reading Festival in November. To download the desktop calendar please select the screen resolution from the list above then right click and "save to desktop". Enjoy! IN STORES NOW! 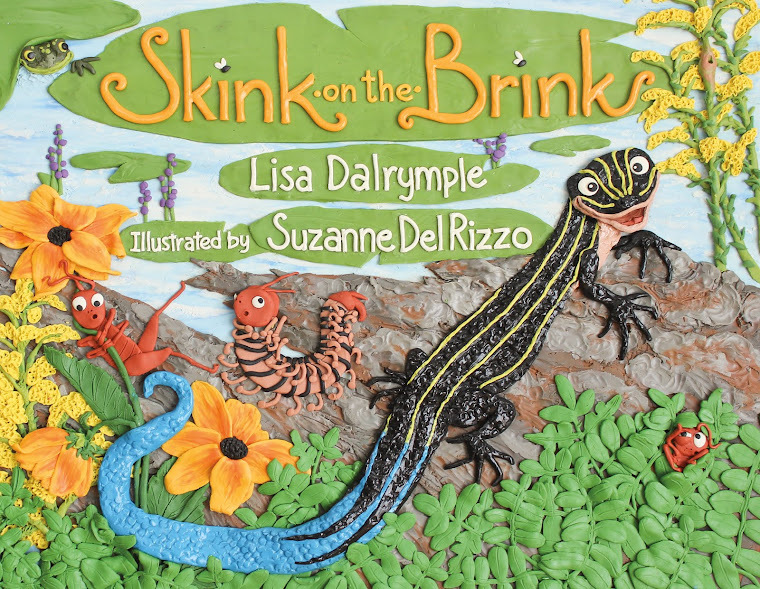 written by Lisa Dalrymple, Illustrated by ME! 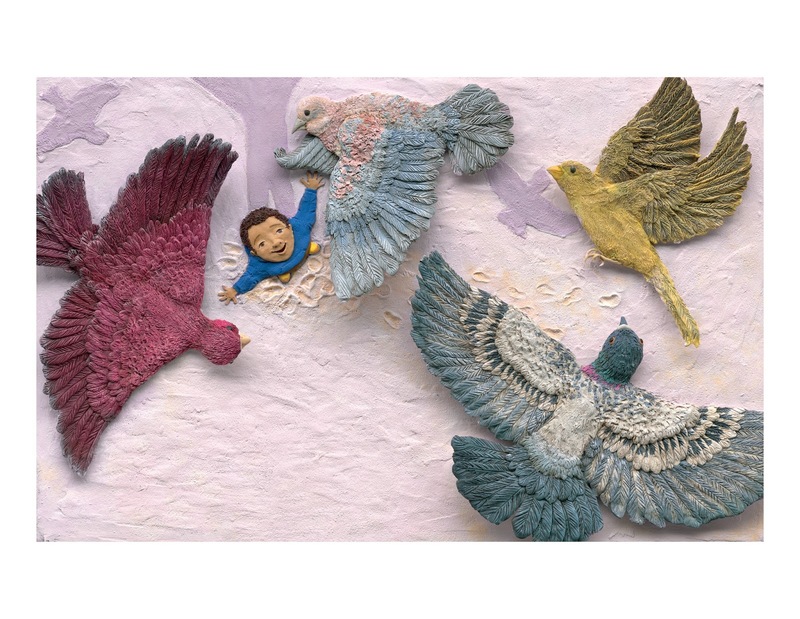 I am a Children's Book Illustrator, specializing in plasticine dimensional illustrations, and mommy to 4 scrumptious kiddies. They are my greatest inspiration. I love a good strong cuppa tea, and I delight in the squish of modeling clay between my fingers. All images and contents of this blog © Suzanne Del Rizzo. Please don't use without permission. 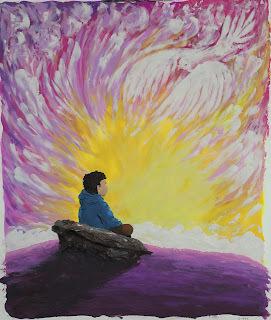 ©Suzanne Del Rizzo 2013. Simple theme. Powered by Blogger.